It’s no secret that for the past few months I have been working very hard on my body to lose some cakey weight and I’m not doing too badly at all, having lost over 2 stone since November 2013 – I’m pretty chuffed to say the very least. 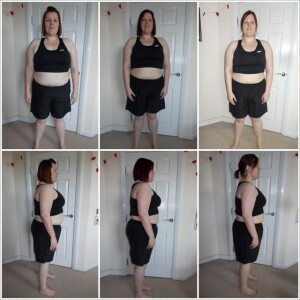 I recently shared a new motivation of mine, my “before and after” photos of which have been spurring me on when I hit days where I don’t see the good work I’m doing in the mirror. 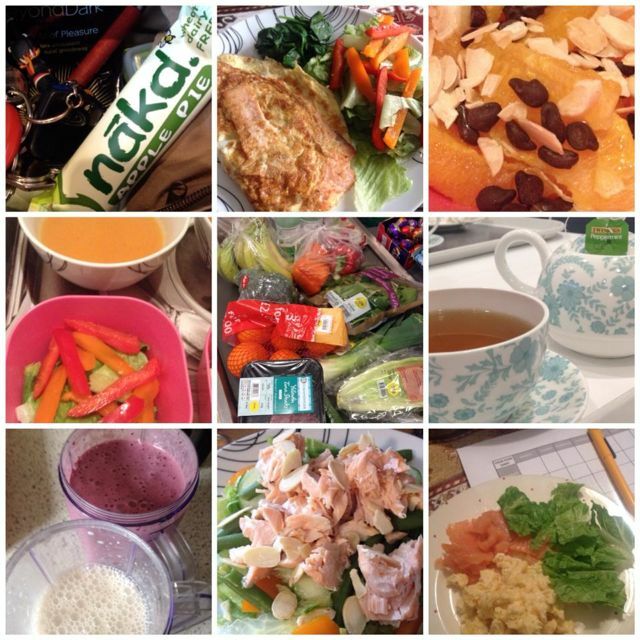 After posting this blog, I was asked by several people about what I actually eat and drink now that I am working with a Personal Trainer. A very interesting question indeed, as I can (within reason) eat whatever I like, but there are a few rules of which I am trying to follow. You can read more about those in a different blog post I wrote a few weeks back. So what do I eat now that I am following a “Raw Food” diet plan? Well, it’s all changed and evolved since week one, so I thought the best way to break this down is to show you how my diet has developed over the past few months… I’ve managed to re-train my taste buds (I am one fussy bugger, so it’s taken some work to re-adjust) and certain foods that I used to hate, I now love and vice versa, it’s been an education I can tell you! 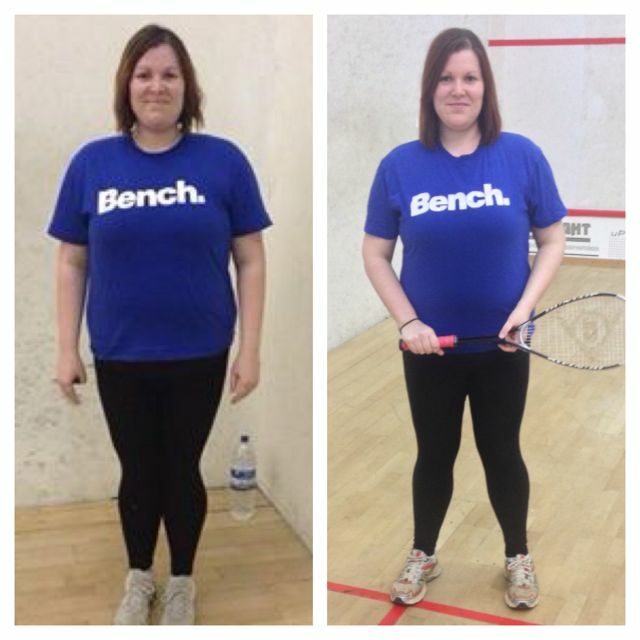 WEEK 1 & 2: This was really just a time of getting to grips with the healthy eating plan provided, detoxing my body after I had blasted it with many takeaways, nights out eating late meals (sometimes even as late as 10pm!) and upping my water intake as much as possible. Basically flushing out the bad stuff, using up my reserves of all the nasty stuff and getting to grips with good home cooked meals. Breakfasts included smoked salmon with poached or scrambled eggs, banana & cinnamon omelette (sweet omelets are DELICIOUS and a great filling option) and fruit and full fat natural yoghurt. Lunches included fresh salads with prawns, salmon fillet baked with a little butter, some herbs and a slice of lemon and leftovers from dinners the night before to help save time. Dinners included vegetable soups, homemade burgers with salad and sweet potato wedges, chili in lettuce wraps (so I didn’t have to miss out on tortillas! ), sweet jacket potato with chicken fajita mix and stir fry with homemade meatballs. I was eating a lot of fruit the first few weeks, this just went to show what a sweet tooth I had, it was scary, so this helped. My fave snack was fresh raspberries, a handful of dark chocolate chips and sprinkled with flaked almonds or cashews for a cinema snack, perfect to keep the fingers busy. WEEK 3 & 4: I was starting to be set mini food challenges by Sarah, such as introducing one new food a week into my diet. 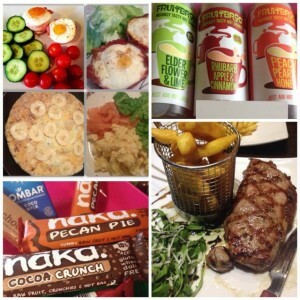 This would help me to vary what I was eating and not get bored over the coming weeks, such a great idea. Tuna steak was my favourite new food at that time (and I still love it marinated in lime juice, a little chili powder and some flavoured rapeseed oil overnight) and I simply grilled it for 60 seconds each side, providing me with a “meaty” option for a non fan of fish. Breakfasts still included a lot of eggs (you can eat as many as you desire, hurrah!) and smoked salmon or ham (ham makes the perfect holder for baked eggs in a cupcake tin, add salad and you have a quick and easy meal for in a rush. I also introduced fruit smoothies to the kitchen, which were perfect for a fast breakfast on the go or a post-workout snack. Lunches and dinners included steak and salad with wedges, king prawn stir fry, sloppy joe mix (without the bread rolls) and a sprinkling of cheese and soups a plenty. We got a little bored of the soups over those weeks! I tried to have 2 portions of fish as week and started to reduce my portion sizes ever so slightly. I tried introducing aubergines to my diet, but they made me feel as sick as I remembered as a kid, I really can’t get my head around them, so that’s out in future meals! Nuts were a great snack and I didn’t (still don’t!) go anywhere without a little Tupperware of mixed nuts to keep me out of trouble when I got hungry. “Nakd” bars are also a great handbag bar to have for emergencies, I think at this point, I need to buy shares in this company! WEEK 5 & 6: This was around the first time I ate out since starting my diet and I really enjoyed it as a treat, rather than as the “norm”. We went to Rockers Steakhouse in Cambridge and I enjoyed the BEST steak I’d had in a long while, added vegetables and avoided alcohol (red wine only if you are going to go for something), opting for sparkling water instead. My exercise was increasing now, throwing kettle bells and medicine balls around, my interval training was making me tired, so my hunger was up hugely, I was ravenous. I ate a lot of meat over these few weeks and as somebody who didn’t eat a lot previously, this took a little getting used to, but I couldn’t get enough. I enjoyed a seared duck breast with salad and wild rice and I introduced duck eggs into my diet for something rich and creamy for my breakfasts, I love these so much! It was a tricky time, as it was Xmas and I had parties, get togethers and I was winding down for the holiday I had planned. I could basically eat what I wanted over this time, was told to worry about it afterwards and I really did enjoy it. 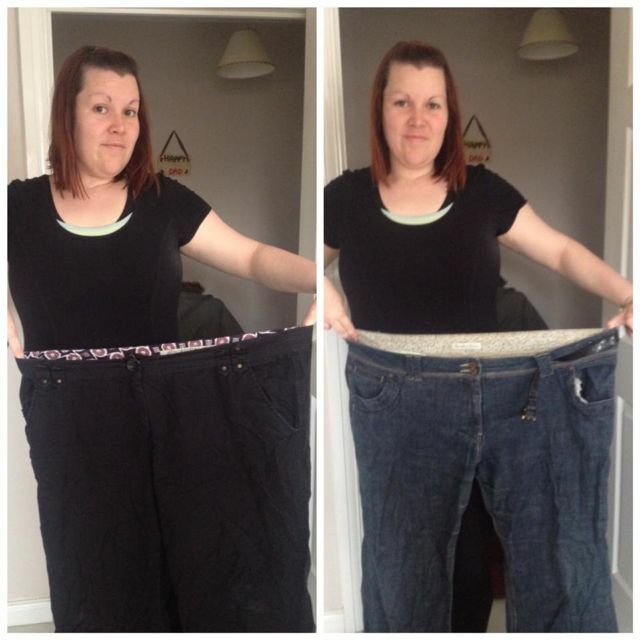 I didn’t mindlessly eat the Quality Street or pick at crisps or sweets, I enjoyed my main meals and exercised by walking the dog and getting out with my new gadgets and keep fit gear that santa brought me… this was a real first for me, I shocked myself! 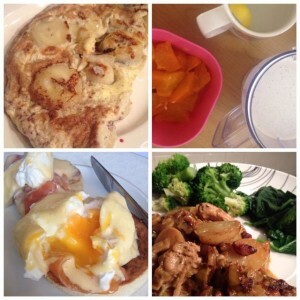 WEEK 7 & 8: I genuinely felt crap for just eating what I wanted over Xmas & New Year… I’d had a few days where I sucked in all my chocolate and had the odd takeaway, so the first weeks of January saw me detox again, but it wasn’t as difficult as weeks 1 & 2, that’s for sure! I went back to soups such as parsnip & apple, carrot & leek, Red Pepper and even made the odd sausage casserole or stir fry. Lots of fresh and colourful food got me on track very quickly and gave me the strength to start jogging between my circuit training. Breakfasts included gluten free porridge oats with a grated apple & cinnamon, poached eggs (trying to perfect this in a pan of water was my mission for weeks!) and blueberries, walnuts & full fat natural yoghurt in a rush. I enjoyed making up a savoury vegetable crumble (Hugh Fearnley-Whittingstall) and stuffing chicken breasts with a soft herby cheese and wrapping it in bacon for a delicious and filling meal with roasted vegetables or salad. In fact it was such an economical dish, it lasted almost a week! WEEK 9 & 10: I was challenged to cut my caffeine intake, of which was rather large, opting for hot water with a slice of lemon or lime instead. It took some doing, but I slept better for this. I upped my water intake to 3-4 litres a day, as I was now exercising 6 days a week, working out in Sarah’s gym twice a week with weights & cardio. 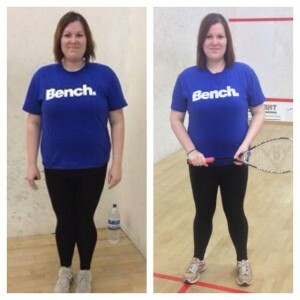 It was New Year and Sarah advised that it takes a lot of motivation for people to get back into it at this time of the year, so it was normal to feel lethargic and emotional, it’s dark, cold and a real come down from Xmas, so I wasn’t doing too badly. I was back to my original weight before Xmas and I was HUNGRY! I ate a lot of nuts, cheese or boiled eggs as quick re-fuel snacks that snuggled in my handbag on the move and I was starting to take a few supplements such as fish oil and multivitamins as suggested by Sarah for my development. My smoothies evolved to more interesting flavours such as cinnamon, natural peanut butter & banana, it’s like a dessert, delicious! One day I massively craved a fish finger sandwich, I couldn’t get it out of my head, so I broke my “no bread” rule and went for it… I didn’t regret it! 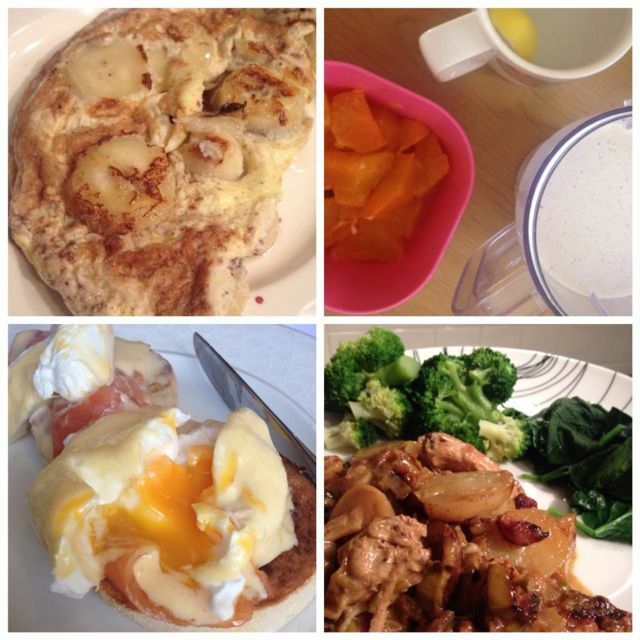 WEEK 11 & 12: Sarah was trying to get me to eat savoury meals for my breakfast, the bigger and more protein filled the better, so basically she was asking me to eat Chili Con Carne for my 7am breakfasts…. this was something I just COULDN’T get my head around for a very long time! However, this week, I managed to enjoy a fish cake with salad for an early breakfast and it wasn’t half bad… Since then I’ve also had chili con carne and sausage and mash with vegetables and red onion gravy for breakfast, it’s really satisfying. I was missing fruit, as my taste for the sweet stuff had pretty much vanished, I re-introduced raspberries, strawberries and grapes and enjoyed a handful whenever I got peckish between meals. I was also making a habit of having a smoothie for my lunch most days of the week, as I now had a smoothie maker with takeaway cup, so a liquid lunch was the norm for me at this time. I didn’t get too bored of it either, which was bizarre as I hated smoothies a few weeks prior. Not being much of a cheese monkey, I was also craving the stinky stuff, so I had the odd lump in place of a NAKD bar and I was also now adding a lot more vegetables to my plate. Green beans, asparagus and broccoli were added to most of my salads and I was enjoying toasting nuts to add to my salads to give them a crunch. WEEK 13 & 14: I didn’t want to waste my money, so finished up my “quorn” goodies and spent most of this week reviewing hotels or spas, so I was enjoying plenty of exercise, relaxing and healthy eating. Somebody else was cooking for me, so I made great choices, did so much exercise, I needed a break after my spa visits and I felt great, energised even. I wasn’t really eating puddings or sweets for the entirety of this plan and this wasn’t changing… my sweet tooth really had disappeared. I found a delicious recipe called “Breton Chicken” for a naughty little meal, a cheesy chicken dish that lasted a good few meals for leftovers. I can’t rate this dish highly enough, it’s gorgeous and simply perfect served with some greens. 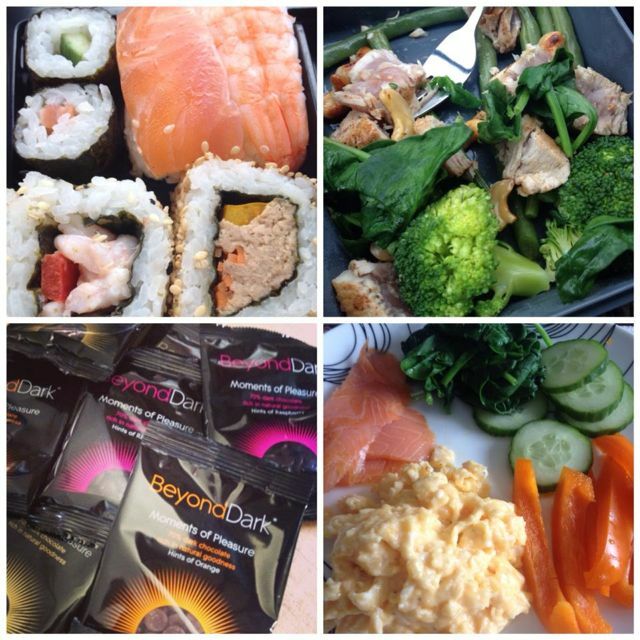 My body was getting tired, I was ill with tonsillitis and flu and enough was enough for the next week or so, I had potentially hit a wall and I spent a few days recovering in bed, eating what I felt like (which wasn’t much) and I was most proud of avoiding my usual “go to” sick meal…. chicken nuggets and supernoodles… yup, it has been a sick tradition for years and years… but I avoided it, much to Sarah’s relief! 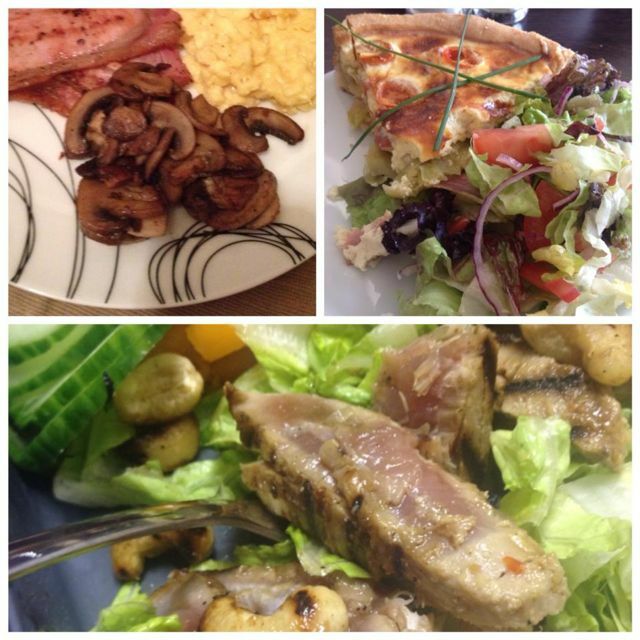 WEEK 15 & 16: A full English breakfast didn’t need to be forgotten when I fancied it, loading up my plate with mushrooms and onion fried in a little butter, bacon, scrambled eggs and a hot lemon & honey was the perfect remedy for a recovering girl. Trying to eat carbs on training days only, I was enjoying sweet jacket potatoes loaded with tuna and cheese and a side salad or a healthy version of fish and chips (baked cod) with sweet potato fries. I was introduced to Wensleydale cheese with cranberries (yum!) and a slither of that when I fancied something naughty was just the ticket. I was also being fairly naughty and back on my caffeine habit… tsk tsk. Sausages and chicken casseroles, turkey steak with stir fried vegetables and beef mince with onions, mushrooms and bacon all provided me with sustenance. Good quality dark chocolate (over 70% where possible) is always on hand for a quick fix sat on the sofa… I am very much an idol eater, so I do have snacks to hand just in case. I also stocked up on chocolate coated “Kallo” rice cakes, these are thin and crispy and a great replacement for popcorn or chocolate bars on those nights where you know you are going to cain a whole packet of something naughty. 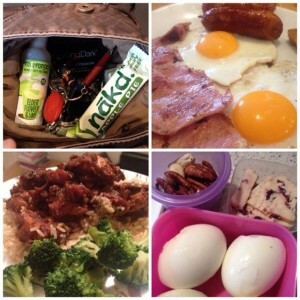 WEEK 17 & 18: Week 17 I didn’t track, as I think I went downhill ever so slightly. I ate many a naughty thing… too many treats to mention and I think because I had denied myself for so long, all of a sudden, I couldn’t stop myself. Chinese takeaway, milkshakes, cake, an entire packet of digestives, you name it, I ate it. I am a comfort eater, it’s no secret, there’s a reason I am a big girl, it’s not rocket science. I’m in the middle of a revamp within my business, creating a new sideline and balancing so many acts at once, I simply get a little emotional. I shut myself away, cancel my commitments and I eat. I exercised too, which would be a REAL first… but I eat for England. I went to Sarah and as soon as I walked into the gym I burst into tears… I work hard, she works hard, I feel as though I have let her down… I haven’t, I’m being so stupid I should be slapped around the face… I am only human. She works me hard and I soon get back to my goals and confidence… I am going to have the odd off day and I now know to be prepared for this and not beat myself up for it. Everything in moderation is true, it really is. 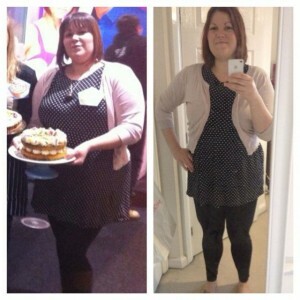 If you deny yourself, you’ll do it anyway… have you SEEN “Secret Eaters” on Channel 4?! 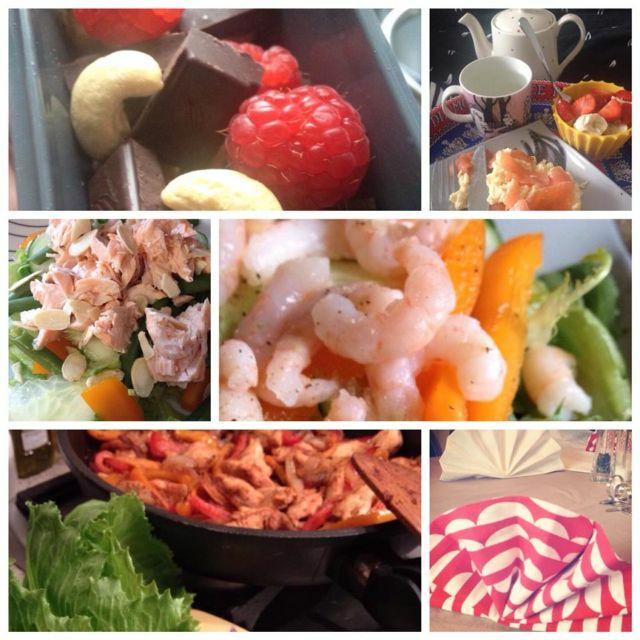 WEEK 19 & 20: I have been told to plan a month ahead, rather than a week at a time, this way I can plan in any special occasion where I KNOW I won’t be sticking to my diet, it’s perfectly ok to enjoy your food and drink and not feel guilty for it. I was eating sushi (great food! ), putting a side salad with my soup to get some more nutrients, having the odd fried egg and ham (fry off a little ham and it goes like bacon, yoink!) and replacing my coffees for herbal teas. I found that carrying lemon or lime slices around i shandy for visiting friends, just add to hot water and you don’t go without a hot drink or use the odd splash of Fruitbroo to make your hot water more interesting. We popped off to the coast after a run one Sunday, so I packed lots of nuts, fruit, boiled eggs and some cheese to graze on over a mini car picnic… this avoided the doughnut or ice cream cravings and helped to fuel me for a good long dog walk along the beach, perfect. Chicken curry can be made with very little effort and when craving a roast, instead of spending near to £40 on a meal out for two, I bought some delicious organic sausages and grilled them, adding them to a plate of roasted vegetables and a homemade red onion gravy… just the job! 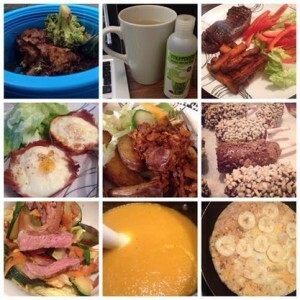 I can honestly say I certainly don’t go hungry, I can eat what I like, when I like and I’m eating more food than I EVER have in my life… It isn’t a diet, just a re-education into what I’m putting in my body and what I’m doing to get rid of the lard hanging onto my limbs… I’m getting there slowly and that’s the way I plan to do it, no “quick fix” here. I had a conversation with a friend the other day who quoted Boy George as saying “If the food is advertised, don’t eat it!” … I like this thought, it certainly gets you thinking! Go for colour, fill your fridge with fresh ingredients and plan, being organised is the key, however much of a pain it is to plan ahead, your body will thank you for it. And if you go off on a tangent, don’t panic, tomorrow is another day, it really isn’t as bad as you are making out. Drink plenty of water, starting your day by sipping a glass before you do anything else, the rest will follow fairly easily in my experience. And don’t forget to keep drinking once you get home from work… I find it easy to drink throughout the day and sometimes forget myself past 6pm, so always keep a glass close by. Sarah says; ” The more you move away from nature, the further you move away from health”… forget the calorie-restricted diets and processed foods, simply eat as nature intended. It’s easy to look in the mirror and not see your progress, so take photos as you move through your own goals and use them to motivate and remind you of what you are doing and what you have achieved. This is 95% of my motivation, I never want to fit into my old clothes again, I’ve always been a big girl for as long as I can remember, so I don’t have the luxury of “looking back” for my goals. Looking forward is VERY tricky when you are venturing to unknown goals, so the little victories, no matter how tiny they might be, will help you keep going. I hope that you find this interesting and if I can help anyone with their own goals, questions or worries, drop me a line. 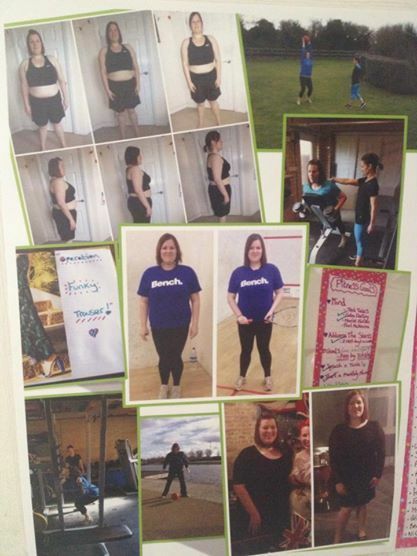 I know just how daunting/frustrating/infuriating/exciting/addictive/emotional weight loss and exercise can be to some, I really DO know, so if I can help or inspire anybody as I go along, I’m thrilled skinny to be of service. And if you want your very own guardian angel in the form of a Personal Trainer, drop Sarah Matthews at Primal Performance a line – she’s fantastic, so inspiring and full of energy (even on a lacking day for me, she helps me to muster up the fuel to enjoy a great workout) and she knows her stuff! Even if you just need dietary advice, Sarah is your gal, I can’t blow her trumpet enough, she’s literally helped me to change my lifestyle into a positive and healthy one, I adore her. 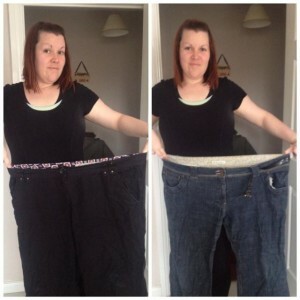 If you enjoyed this post and want to read more of my weight loss journey, you can find more posts here. You are an inspiration ! I am printing off your notes with the aim to put them into practice. I am very much an emotional eater and am finding it hard to get started. I keep attempting a start and get to teatime and fall ff the wagon. I secretly eat mainly in the evening. I am terrible for saying I will start it tomorrow. I am dreading the summer months as no clothes fit. It is drastically affecting my life in such a negative way. I found the information you have provided very helpful. I just wanted to ask what initially got you motivated and got you started.